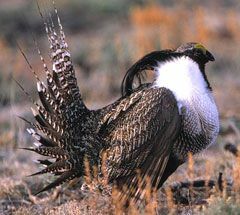 The feds have finally released environmentalists’ their proposed plan to shut down energy development, grazing, and roads in Colorado, also known as the new Gunnison sage grouse management plans. In addition to crippling energy and grazing in one fell swoop, the new rules also limit right of ways for utility lines and pipelines. The proposals include closing or limiting the use of some areas during the birds’ mating season, from mid-March to Mid-May, and during harsh winter weather. All of this to “protect” a subspecies of grouse that was “discovered” in 2000, and five minutes later proposed as a listing for a threatened species. Having seen what happened with the management plans for the most infamous subspecies of all, the Northern spotted owl, we aren’t surprised that the proposed restrictions are so severe. Afterall, the goal is to remove humans and kill economic development. The subspecies is just a means to that end. John Swartout, a policy adviser to Gov. Hickenlooper, said they worked closely with the BLM to develop the plan, to make sure it was consistent with plans to protect the greater sage grouse — which also cripples the grazing, energy and housing industry. The proposal will now undergo a 90 day review period so environmentalists can flood the BLM with form letters demanding even more restrictions, and the final plan will be presented in a year.